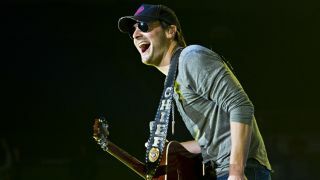 "He has a real dedicated, almost Springsteen-ish work ethic," Sony/ATV's Troy Tomlinson says of Eric Church, seen her performing in Ohio, October 2012. While the decline in music sales for most genres is expected to continue its decade-long pace in 2012, it would appear that there's still a healthy amount of gold, platinum and multi-platinum to be found along the streets of Nashville's Music Row. A casual glance at the latest Soundscan Top Albums chart lists robust and even seismic sellers by the likes of Taylor Swift, Kenny Chesney, Jason Aldean, Blake Shelton, Luke Bryan and Eric Church. All of whom are under the Sony/ATV Music Publishing tent headed up by Troy Tomlinson, President and CEO of Sony/ATV Music Publishing Nashville. In addition to these artists, Tomlinson, who joined the company in 2002 as Vice President of Creative and ascended to the presidency three years later, has helped guide the songwriting careers of Rascal Flatts' Gary Levox, Jay DeMarcus and Joe Don Rooney, Miranda Lambert, Brooks & Dunn's Kix Brooks and Ronnie Dunn, along with a host of hit tunesmiths. Tomlinson sat down with MusicRadar recently to talk about the state of country music publishing, how he pairs writers with artists, changes in technology and how they affect the marketplace and the ways in which he deals with talent, and whether aspiring country songwriters really need to relocate to Nashville to compete with the big guns. In addition, Tomlinson offered his personal and professional thoughts on a handful of Sony/ATV's marquee acts. How has publishing changed in years since you've been with Sony? "I think the changes that have happened since then were ones that started a little earlier. We had just begun to see the shift away from physical product. In country, interestingly, we lagged behind that decline. When other consumers were readily and quickly going to digital means to deliver their music, country consumers were still going to the CD. We've experienced a decline, sure, but not as strong as it's been in other genres." "For country, the biggest single reason is that more than 50 percent, between 50 and 60 percent, of all physical country music was sold at Wal-Mart. That was at the peak of sales in America. Country consumers in the late '90s and early 2000s were at Wal-Mart every week of the year. That's where they buy a lot of their household items, and it's where they're used to purchasing music. "There are other arguments, but think about it: If you go to Wal-Mart to buy your Tide and your Clorox and your groceries and things like that, and if you have any discretionary money left over, you pick up a physical CD. Just because the rest of the music world is buying music online, if that's the store you're in week after week, you might not change your habit of picking up a CD." Troy Tomlinson, President and CEO of Sony/ATV Music Publishing Nashville. "Secondly, in the late '90s and early 2000s, broadband in rural areas hadn't reached the availability level that it had for other areas. If the consumers were still trying to download something on dial-up connections, they're simply not going to want to deal with it, and they'll go back to the store and buy a CD. And even if they had high-speed internet at work, they couldn't buy music there; they'd get home and still have the dial-up. So even people with some access to broadband would continue purchasing CDs. They liked the ease of going to Wal-Mart. "Eventually, high-speed internet got into the rural areas, and so we have seen the shift to digital sales. If you look on the charts, you'll see that sales of country singles are going crazy digitally. That said, sales of country CDs are 50 percent at Wal-Mart stores. "Country music consumers are very loyal. They feel as though they know the artists. They have a hunger for knowledge of the artists, and they want to invest the time in every little detail of the music stars they love. The picking up of a physical CD with a booklet and pictures and thank-yous and special messages is very important to them." As a publisher in country music, when you look at signing a new artist, how important is cross-over appeal? "I kind of look at it like this, and this is way too general, but I'm going to say it anyway: If Kenny Chesney's base is a million folks, hypothetically, and if he had a song that crossed over beyond his base, that certainly wouldn't hurt him. He wouldn't lose any fans, but he might gain some new people. So that's a gain. "Jason Aldean and Kelly Clarkson - we had a song about a year ago called Don't You Wanna Stay. It's a Jason Aldean single, but it's the duet with Kelly Clarkson. It was a country single, but it took on a life of its own on multiple charts. I think it didn't hurt Jason's base in any way, but it probably turned some other people on to who he is. "It's an added benefit to me. We're not dependent on cross-over, and we never have been. But when it does organically happen, it can be rewarding for that artist. It expands the tent. In country, we have artists who are very traditional, and we have some that have the pop thing. If you can get an artist to move those tent posts slightly, it can be very beneficial." In general, how do you go about pairing songwriters and artists? Do you try to forge relationships? "Yeah, absolutely. It's a community, but it's pretty small, which makes it easy. We're basically three or four streets, each one about a mile long, so within that area you have a big percentage of the music industry. We see each other in all the restaurants, we're in and out of one another's offices, and many of our kids go to school together. And then there's church - many of the artists, writers, publishers and record label executives might go to the same church. It's close-knit. "Because it's such a small community, there's a lot of opportunities for relationships to be forged. Beyond that, to your point, we do, as publishers, try to think about the people that we know; we know the artists' temperaments, what they're capable of, their likes and dislikes, and so on. We try to look at the rosters of our competitors to see who might work with our artists. And vice versa. "To use a coarse way of saying it, we used to just throw people in bed together and say, 'OK, now y'all just love each other.' [Laughs] In the '90s, when life was so beautiful in the music business, that actually worked OK. We considered gold almost a failure. So you could take chances and be sort of willy-nilly about putting people together and hoping that something would work. "Now we're a little more methodical and thoughtful about asking one of our artists to give up half a day to be with a writer they don't know. What I love to do is take the writer out with me to a show somewhere out of town to meet the artist. We go backstage or maybe sit on the bus and spend some time, letting them get to know each other over a drink. I let them hang. Then I'll circle back with the artist maybe a week or so later and see how it went. A lot of times, that's the kind of thing that works out." Do you ever come across lyricists who need a melody writers, sort of the way that Elton John and Bernie Taupin combined their talents back in the late '60s? "It does exist, but it's not prevalent. To be honest, when you think of great melodies, they can be anything from Beatles songs to Wind Beneath My Wings to Barbra Streisand to show tunes. But so much of country is very groove oriented now. So the idea of taking this Bridge Over Troubled Water melody-type guy person and putting him with a lyricist, it's not so much what we think about. "We look at our artists as people who know what they want to say. They know who they are, they know who the audience is, and they know the message they have to deliver. What we try to put in the room with them is both - a really cool groove/melody person and a super, super lyricist. You've got the crafts people who can bring their gifts, and you've got the artist who can write a little, and he knows the message he wants to give to his audience. You want it to be authentic and transparent. "Of course, there's Taylor Swift. She's an exception to so many rules. She can freely sit down in a room and write something all by herself that just knocks you down in your tracks. Or she can get in a room with somebody who can bring some groove, somebody who excites her, and they'll collaborate musically and lyrically - and it'll be another kind of song that stops you in your tracks. Her talents are staggering." If somebody wants to be a country-based songwriter, how important is it to actually live in Nashville? Can a writer do it from anywhere? "In the '90s, even though I wouldn't have advised against it, you could do that and compete, because there were so many companies and so many artists on the rosters, and there were so many opportunities for artists breaking in the format. There were a handful of hit writers who lived outside of Nashville, and when I say 'handful,' I mean you could count them on one hand. "Today, you've got shorter playlists and tighter everything, so it's not advisable to live somewhere else and try to compete on these streets. It goes back to the idea of community: a writer who lives in Rhode Island is competing with all of those writers who are right here on these three streets. You can write great songs and live somewhere else, but there's no substitute for bumping into an artist on the street, in a club or a restaurant - and it does happen." Tomlinson with Kenny Chesney (middle) and BMI's Clay Bradley (right). "Now, a great song is a great song, and artists want to cut great songs - they don't care where you are. But if I look down the Soundscan charts, it's going to be an exception to the rule, unless someone is dedicating a large amount of time to this market. We have some LA writers, some pop writers - they have condos here, and they come over a few times a year to work with other folks. They can compete. But the idea of sitting down somewhere else and writing a song, sending in an MP3… it can happen, there can be a cut now and again, but you're certainly not setting yourself up to have a large quantity of recordings. Like the old saying goes, 'You have to be present to win.'" How have the advances in technology changed how you work with talent? Nowadays, songwriters can make amazing demos at home - they can make records at home! "That's a great question. The ease of recording at home has increased the number of demos that we get, because we're no longer bound to the availability of studios, when the pickers are all available and that kind of thing. Nowadays, writers get together, they work on a song, and at the end of the day they can MP3 me the demo, and we're pitching it that night. It's wonderful from that perspective. "I do notice that there are writers who want to book a session two months out; they'll get the pickers they want, get the studio and the engineer they want, and they'll sort of write to the session. But more and more now, writers are creating at home. It's hastened the ability to get songs to artists anywhere in the world. You get the answer back quickly, and that way you know if that's the song for them, or if you need to move on to the next artist. So yeah, the changes in technology has allowed us to work fast. "We only get a handful of those super special songs that you want to get to the superstar artists the minute they're created. It used to take so long to get them the track, and then you had to wait for them to get to it and all that. In that time, you might have missed another act that might want the song. Most of the artists who I work with closely, if I send them an MP3 of a special song, I'll get a response back within 24 hours - and many times within an hour." Looking ahead, what do you see as the biggest challenges for you in music publishing? "The continued decline of full-album sales, whether it's the physical CD or through downloading. It hasn't hit us as hard as some other genres, but it's there. The continued singles-based sales obviously affects our income. And also, our performance income as an industry. Broadcast radio has had some hard years, which affects publisher and writer performance royalties. Those are the negatives, the things that concern me. "The positives are that we see more and more opportunities for sync placements, whether it's film or television or TV commercials - internet commercials, too. You see growth in those areas. I keep holding to the position, and maybe it's naïve, that if accessing music is easier than it's ever been, and if it's less expensive to access music that you love, I have to be hopeful! [Laughs] If you can get it, if it's accessible, if it's cheaper… I have to think there will be an increase in the consumption of that product. "Is that pie-in-the-sky stuff? Maybe. But I'm a hopeful guy. I see opportunities, and I see a lot of talent out there. If you're creative and if you try real hard, you can make it in this business. There's lots of doors that are still open for creative people. And if you can make a decent living doing what you love, you're pretty blessed." "She's among the very few artists who are born with a gift that just rolls out of her. I was getting ready to speak on a panel a few weeks back, and I pulled out some CDs of the earliest songs she turned in when she was 14 or 15 years old. I still marvel at how this young girl with limited life experiences at that point could write such lyrics and melodies. She was born with it, that gift. "I'm so fortunate that I get to hear the songs and read those wonderful lyrics before the rest of the world, and I anticipate how everybody will react when they hear them. A super-gifted songwriter." "The last 20 years, I've been fortunate to see him sell more and more tickets. He's had seven or eight years now where I think he sold a million tickets each year. He really built it right. He knows that the priority in his career is cutting great songs. He understands his fans as well as any artist I've ever been involved with - or even heard of. He cares about his fans and wants to give them what they want from him. He steps up on that stage with a killer band, songs that matter, and he slays them with his performance." "An authentic artist in every sense of the word. Miranda is Miranda, and if you dig Miranda, great. Miranda is Miranda, and if you don't dig Miranda, great. [Laughs] She is as real as it gets. She writes from the heart, she records special songs that she didn't write, and she's genuine." "You wouldn't meet three guys that have sold as many records as they've sold, performed for as many people as they have, and still be able to like them as much as you would these guys. They have genuine hearts, they're givers, and they're total salt-of-the-earth people. They write a few songs on their albums, just like Kenny Chesney does, but when they hear a great song, they want to record it. They've had some really big songs that they had nothing to do with as writers, but they understood that it would be important to their audience." Kix Brooks and Ronnie Dunn. "I don't know of a better country male vocalist than Ronnie Dunn. When he opens his mouth, he makes me believe. The entire lyric of the song could be a lie, and I'd still believe it because of his vocal. And Kix Brooks is not only a longtime songwriter who had hits before Brooks & Dunn, he's also a joy-filled guy who's driven every day to fill his time with positive things. "You put Ronnie Dunn's vocals with the energy that Kix Brooks had and has, it's no wonder they've sold over 30 million albums. I hate not seeing them together, but I have a great relationship with both of them. They did as much for our format as any artist has in decades. They busted it wide open with their first album, Brand New Man." Any new artists or writers that you're excited about? "Well, of course, there's Eric Church. Yeah, and he's already big [laughs]. "He's big [laughs]. The trajectory for him is obvious to anyone. Regardless of whether he wanted to be an artist or not, he's a gifted songwriter who is blowing it up on the road, growing year after year. Sales are great, radio has a fantastic relationship with him, and the song Springsteen really took him to a new level. He has a real dedicated, almost Springsteen-ish work ethic. "On the up and coming, and he's already platinum and having hits, there's Luke Bryan. Again, he's a guy who loves to write, but he loves to cut a great outside song. You can see a pattern here - I love it when an artist will consider outside songs. Luke's making great records. He reminds me of Kenny in the early years. He endears himself to the crowds. "On that newer level, there's Chris Young. A talented, talented songwriter who's already had five No. 1s. He has a boy-next-door kind of smile that really endears himself to people. "And then a kid named Thomas Rhett Akins. He's on one of the Big Machine labels. He's got his own album out, and he's getting cuts on other artists' records, as well. His father is Rhett Akins, who's a very successful Nashville songwriter. So Thomas caught the songwriting bug. [Laughs] I love seeing talent go on and on like that."